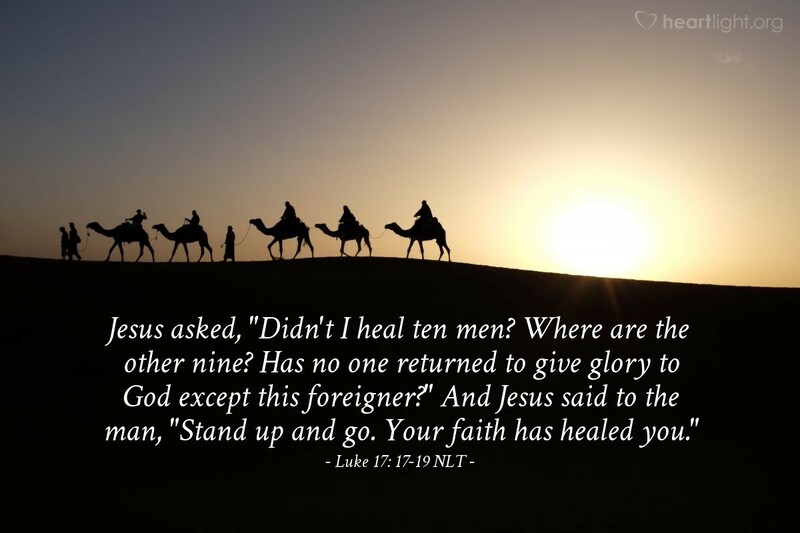 Jesus said, "Ten men were healed; where are the other nine? This man is not even a Jew! Is he the only one that came back to give praise to God?" Then Jesus said to the man, "Stand up! You can go. You were healed because you believed." "Where are the other nine?" Jesus says some sad things during his earthly ministry that tear apart our hearts: "My God, my God, why have you forsaken me?" "Peter, do you love me?" "Judas, is it with a kiss that you are betraying the Son of Man?" "Into your hands I commit my spirit." All of these statements are agonizing. Unfortunately he has to keep saying, "Where are the other nine?" or something like it quite frequently. Many of us go to the Father using the name and authority of Jesus and ask for many things great and small. In great love and mercy, the Father and the Son often bless us with precisely what we ask of them. Yet with so many blessings lavished on us, our prayers remain focused upon getting more rather than thanking and praising them for their generosity and grace. I'm sure they have to be hurt by the constant questions of heaven, "Where is the thanks?" Almighty God and loving Father, forgive me for my self-centered preoccupation. You have blessed me with so much and I seem to thank you for so little. I praise you for your selfless love, your abundant mercy, your costly grace, your faithfulness to your promises, and your assurance of my future with you. Thank you for your Holy Spirit who intercedes right now as I pray and who strengthens, equips, leads, and empowers me. Thank you for the breath I breathe, the food I eat, the clothes I wear, and the place I lay my head at night. For these, and thousands of other blessings from your hand, I thank you. In Jesus name. Amen.